As presidential campaigns begin, it is important to understand the difference between these two and the people who benefit from them. The so-called federal entitlement programs include Social Security, Medicare and Medicaid along with a few others. These programs totaled $1.9 trillion for 2010 exlcuding Veterans benefits. Ninety-one percent of these benefits go to individuals who are elderly (over 65), disabled, or members of working households. 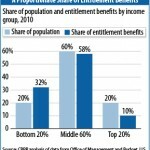 Only nine percent of the recipients are non-working, non-elderly, or not disabled. 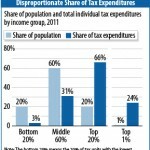 Low income individuals, as you might imagine, receive a share of these expenditures larger than their share of the population as shown in this chart. While the upper 20 receive less, it is significant that the middle class receives a share proportionate to it share of the population. Tax entitlement–a term coined by Federal Reserve Chair Alan Greenspan–refers to the various tax deductions and credits provided through the federal Tax Code. In 2011 these amounted to $1.1 trillion. In this case, the top 20 percent of the population receives 90 percent of these tax entitlements with the top one percent receiving 24 percent. The full picture is shown in the included chart.